OK Since I spent the past few months getting this working and going back and forth with AIM and Hondata I figured I would do a write-up on how I did it. Why would you do this? 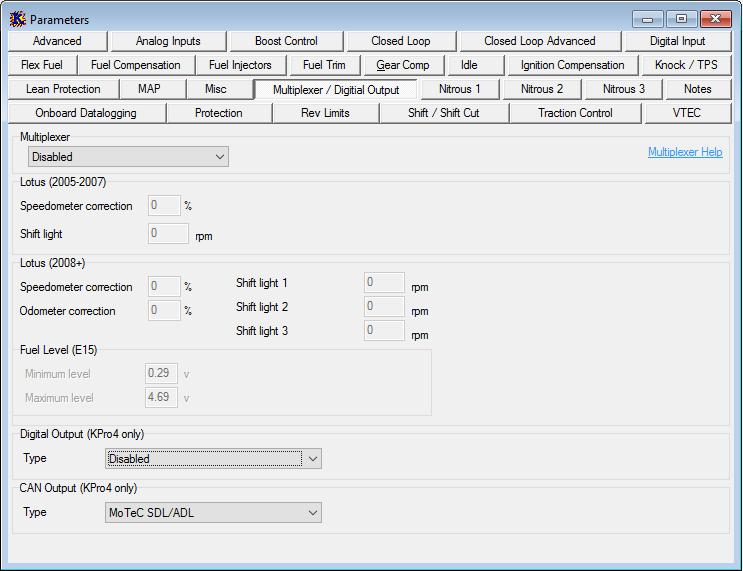 You have a Kpro4 and an AIM solo DL and want ALL your ecu data overlayed with g-loads and speed etc. If you lost a motor at the track and wondered why, this would likely answer it for you. 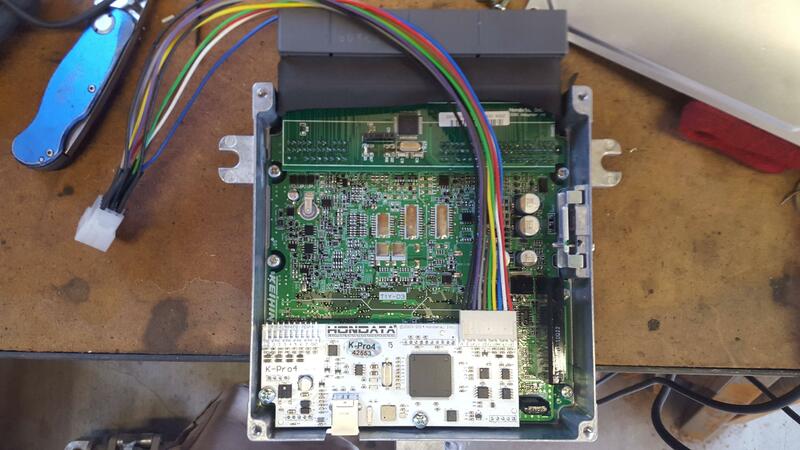 So this write-up will cover BOTH Serial and CanBus data as the resulting harness will do both. First things first, remove the ECU from the car and open it up. Connect the accessory harness like this making sure to note the black wire is on the GND pin. This orientation is important. At this point you will want to strip the end of every wire on the accessory harness and pin them with the MALE pins from one the molex kits. Next take the harness supplied by AIM. On this harness you will strip and pin with Female molex connectors everything except pin 3 (VBEXT). Next take the male half of the lead coming from the Kpro, make sure to orient the molex connector correctly so you can match up the wires. Finally the VBext wire should go to 12V switched power. I used the softtop power lead on the passenger side. Doesnt matter where you get this as long as its 12v power. This will power and charge your solo. For this I soldered a extension and ran a wire to the passenger side behind the radio. 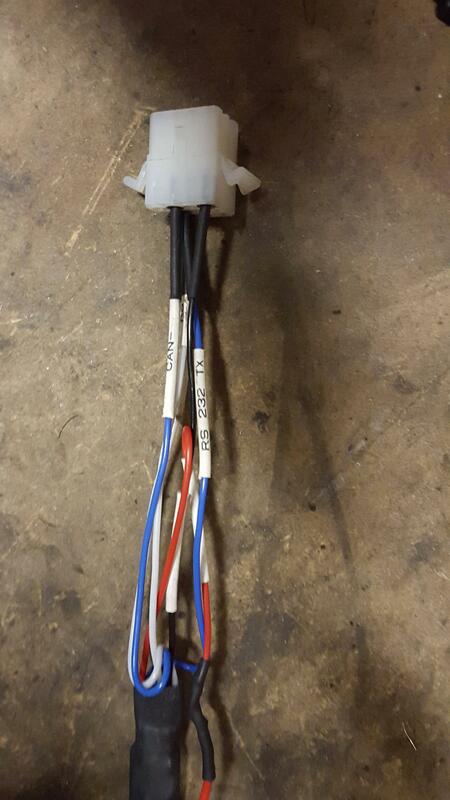 At this stage you should take a moment to cover up your wiring with some split flex or wire loom. At this stage you can wire loom the accessory harness as well and I highly recommend you tape the sub harness to the main ECU connector (I had the subharness pull off the connecotr inside the ECU case a few times during the process which is why i started taping it. You should use serial if you dont need anything beyond whats available in the normal hondata app for datalogging. 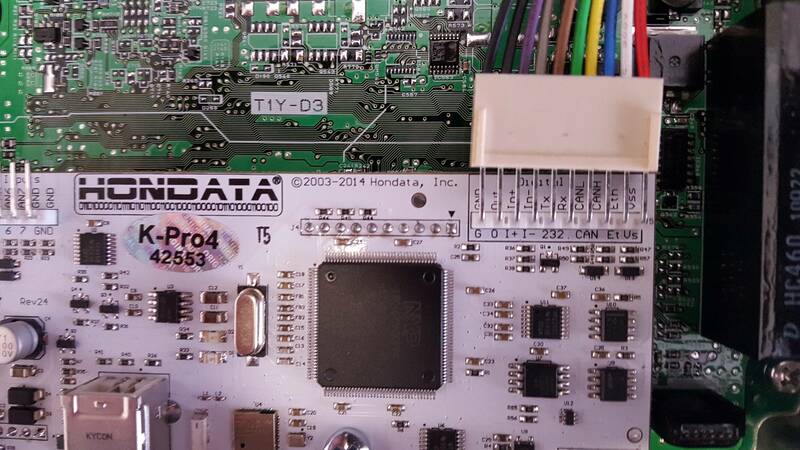 You should use CAN if you want to datalog all of the ECU vitals as well as analog channels (3rd party Oil pressure/temp/wideband/ethanol sensors). After uploading this change you will NEED to shut the car down AND disconnect the USB cable before it will take effect. For this you will need a beta driver from AIM. Once you have this beta driver there will be a KPRO4_CAN option for a config. You can acquire this driver by emailing AIM support or PM me, but AIM's version will likely be newer. This project is still a bit of a work in progress but its for sure working so I wanted to document what I did for anyone that wants to follow in my footsteps. 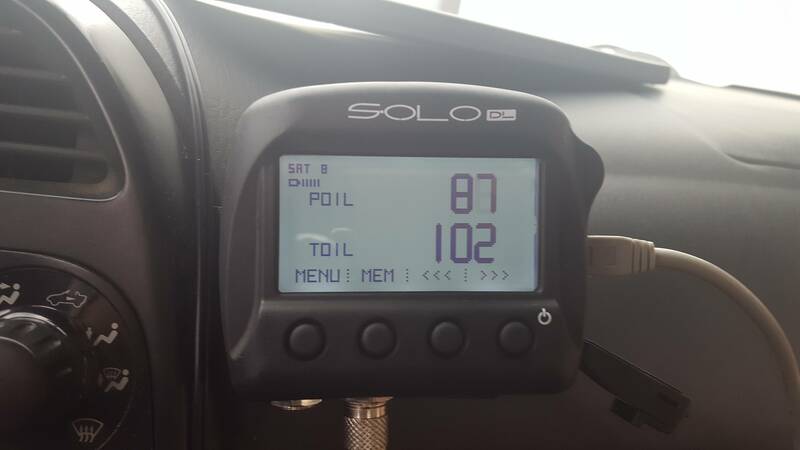 Still outstanding: I have oil pressure and temp now being logged but the data doesnt yet display on the solo. Still working with AIM on this. Oil pressure and Oil temp logging! So as of now AIM has worked out a driver that I have tested and have working recording oil pressure and temp in their native units. 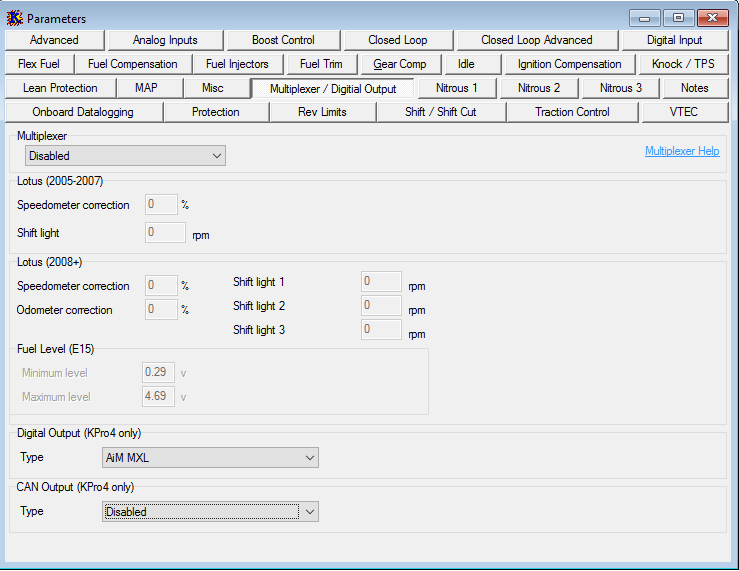 The ECU driver from AIM is hard coded to do this translation on those inputs. Locate a +5v sensor voltage source on the ECU (VCC3 is recommended). This is where you will use the vampire tap. Make a Y on the spade connector that connects to the vampire tap as this will feed BOTH of the sensors. For cleanliness I would join the grounds together on the sensor side of the molex connector and feed the +5v from the tap THROUGH one of the spare molex pins so you only need to disconnect the molex connector to get the whole thing out. 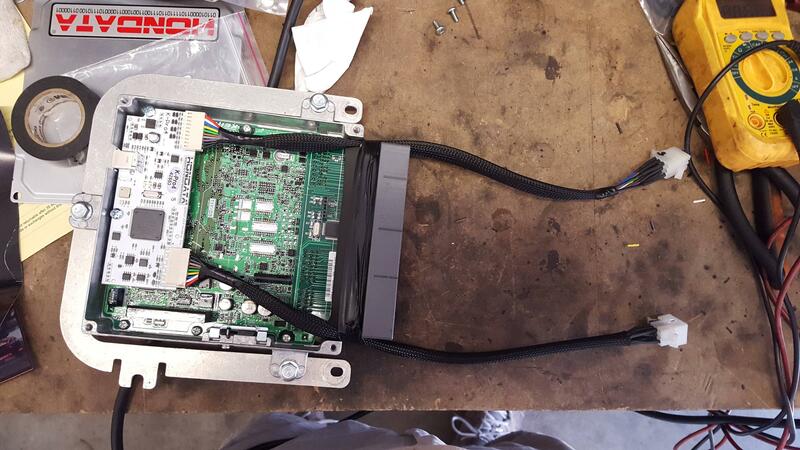 The harnesses provided by Autometer are EXACTLY long enough to come through the firewall where the rest of the harness does, and run around the firewall past the battery and meet the sandwich adapter. If you want to attempt this feel free to PM me and i can provide my AIM driver or AIM support can. Nice job! This makes me want to get a Solo DL now. I have yet to see what an AIM Solo DL hooked up to a 2006+ DBW car can produce. Here is what is available from the KPRO canbus feed (i have scrolled down so the built in channels are cut-off at the top but still there. Im presently working with AIM on getting ECU definition files so it can log oil pressure and oil temp in native measurements and not just voltage (its logging now and the voltage is converted in Race Studio but I want native units). Post #2 updated with Oil pressure / Temp feeds now feeding the datalogger! 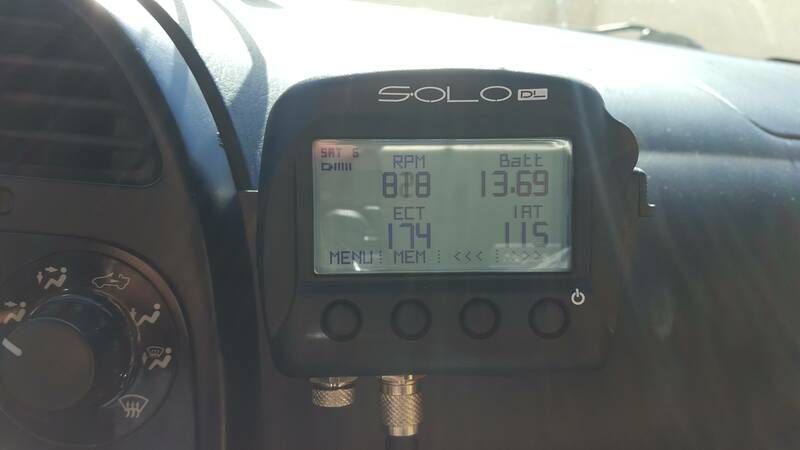 One of the nicest things about the Solo DL is that the analysis software isn't complete trash like so many of the other less expensive lap timers/loggers. Awesome you got this working with KPro! At $700 I would hope so. That's two track weekends with instruction that would make about 95% of the drivers on this site much faster than any possible data analysis they would get from an AIM Solo DL. This was an amazing writeup. You went above and beyond providing those links for us. Great job dude, after reading it I feel like I could almost do it.